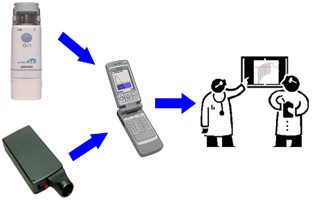 Given the huge unsatisfied demand for healthcare professionals and the overwhelming need for the provision of healthcare services in developing countries, e-Health/telemedicine services could be an efficient and effective mean to achieve national health policy objectives and to improve and extend healthcare services especially to non urban and remote areas. With the introduction of mobile communication, the telecommunication industry has been reshaped. This has resulted in many new opportunities for e-Health. Mobile e-Health (m-Health) is a new and evolving area of e-Health. With large scale mobile networks and the continuing developments in multimedia tools and video image quality, there is a real opportunity to significantly increase access of rural populations to quality healthcare services where many of them are now excluded from the medical benefits enjoyed by their urban counterparts. With mobile communication, populations can be treated in their homes and communities with access to expert care. Any healthcare personnel can get access to vital information anywhere and at any time. Wireless technologies increase real time access to accurate patient data, including clinical histories, treatment, medication, tests, laboratory results, etc. and result in overall improvement of patient care and the provision of personalized health services. Mobile technologies can also improve data accuracy and significantly reduce errors during data collection and disease surveillance. 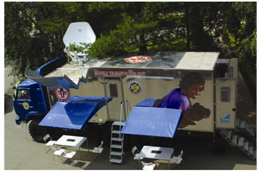 Mobile clinics and mobile portable e-Health terminals can take healthcare to distant locations to support prompt medical assistance at remote sites or during emergency responses. ITU has long standing experience in the area of e-Health and has implemented telemedicine projects in developing countries and organized seminars and workshops on telemedicine in different parts of the world since 1994. Furthermore, the ITU Telecommunication Development Bureau (ITU-D), through its Study Groups, is facilitating the establishment of collaboration platforms that bring together e-Health experts from the industry, academic institutions and NGOs to stimulate cooperation and knowledge sharing. The ITU-D Study Group 2, Question 14-3/2 on Telecommunications for e-Health, in particular, is taking further steps to assist in raising the awareness of decision makers, regulators, telecommunication operators, donors and customers and disseminate experiences and best practices about the role of information and telecommunications technologies in improving healthcare delivery in developing countries and is promoting development of technical standards for e-Health application in conjunction with ITU Standardization sector (ITU-T). 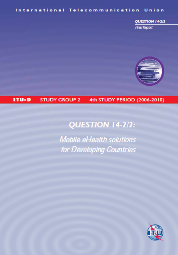 Download the Question 14 report on "Mobile e-Health Solutions for Developing Countries"
The report highlights the role of mobile telecommunication technology in health care by offering at a distance the medical consultation and administration of patient treatment. The goal of the report is to offer some practical information on some of the ongoing Mobile Health solutions. The report provides some background information related to: what is Mobile Health, how to use Clinical Decision Support Software and Traffic Control System for Medical Information Network, Models of Wireless Access and Connectivity, etc. ; and presents some practical examples from different countries. This includes the deployment of telemedicine equipment and e-Health terminals to distant locations to support medical assistance at remote sites or during emergency responses.